Chutney is most widely known condiment originating in India. Indian thali meals or some typical meals will be incomplete if chutney would have not been there. There are hundreds of different recipes of chutneys and there are again hundred variations to one chutney. Chutneys are meant to give your food a tickling taste. It can be hot, sweet, tangy or a combination. In olden days chutneys were made with Mortar and pestle, some people do it still. I remember my mother doing this way and the taste of it was just awesome. Now the mortar and pestle has been replaced with gadgets, but we still have the chutney’s. They are also a savior when we do not have a Bhaji (vegetable) or are just getting lazy to cook. Many are freshly prepared and consumed and some can be stored in freeze /freezer. Did you try my Coriander Chutney yet?. This is an update for my old post, with respect to write up and step by step pictures. Put all the ingredients in a mixer and grind. Add 1 tablespoon of water at a time if required. Grind till a coarse or smooth consistency as desired. Heat oil in a small kadai or pan. Once heated add the mustard seeds and curry leaves. Once the mustard crackles add the Red chillies and now pour the mixture over the chutney and mix. Yummy and spicy chutney is ready. Serve it with Idli or Dosa. My favourite to eat with dosas! So refreshing! Color of the Chutney is vibrant and inviting. 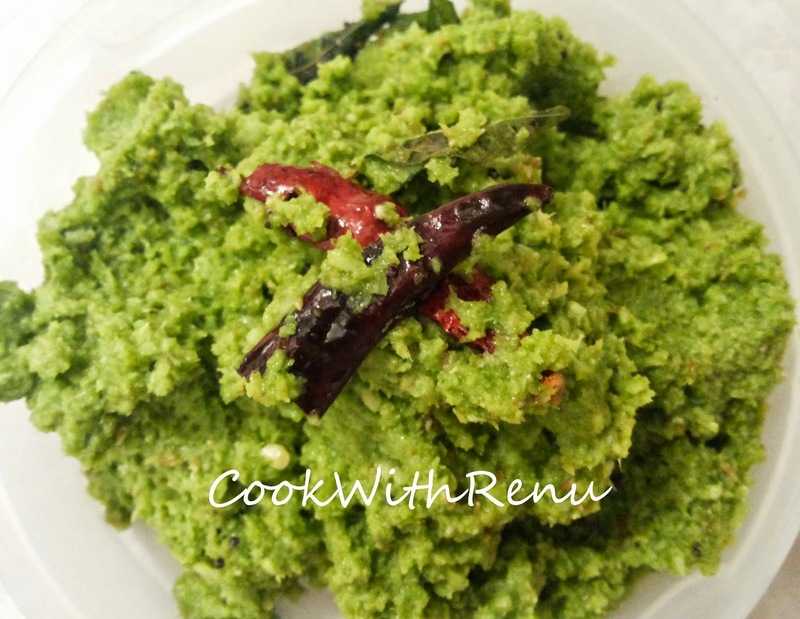 A yummy chutney to serve with idli and dosa. Green chutney was a must have for all meals in our house. Makes every meal taste better. The green chutney has umpteen variations, I like this version, it has such a beautiful green, so healthy too. I love this chutney and makes a wonderful side dish for tiffin!..very nicely done. I always have a jar of green chutney in the fridge as its really handy. I love to spread on bread, rotis and even mix it with leftover rice. I use to help my mum make chutney using the mortar and pestle. Often make coconut and coriander chutney in similar way. Perfect side dish for idli and dosa. Looks so inviting. I love coconut chutney with garlic and coriander. I also add some roasted gram to it. Perfect match for idlis, dosas and variety rices. I have never added garlic to coconut chutney. I must try this. Thanks for sharing. Love the vibrant green colour of the chutney….garlic is an interesting addition. Looks yum! That is such a delicious chuntey Renu. Coconut and coriander is an awesome combination. Will have to try this one out some time. Looks yummy Renu. This is always the chutney that I make. I too love adding coriander in coconut chutney and yours looks finger licking delicious.